frightened crying girl gagged, lies on the floor with tied hands. 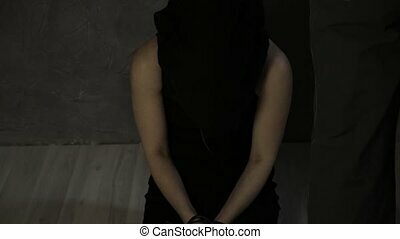 linen bag on the head of a hostage. kidnapping and violence. frightened girl gagged lies on the floor with tied hands. kidnapping and violence. 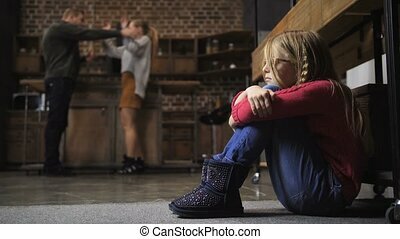 Upset scared teen girl sitting on the floor with her arms around knees, while her violent parents beating each other on the background. Domestic abuse, physical violence, difficult childhood concept.